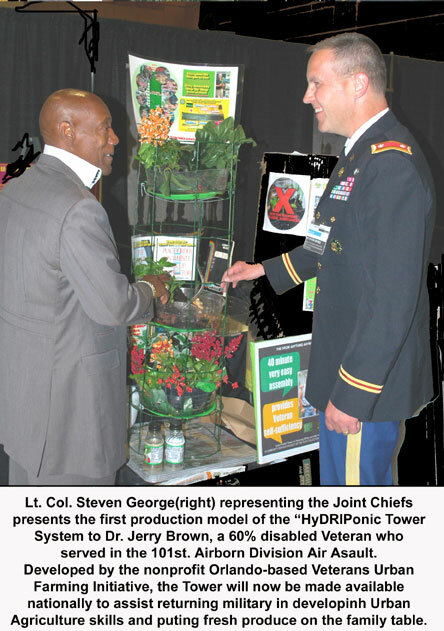 A new means of overcoming frustration and despair in today’s limited job marketplace called the GROW ANYTHING TOWER was recognized by the Joint Chiefs for its development at the Augusta Warrior Community Integration Symposium. Its unique approach for softening transition to civilian life by encouraging Veteran feelings of self-worth and maintaining self-sufficiency through learning Urban Agriculture skills will now be made available nationally. A grant program to channel Public purchase revenues to underwrite free Towers for Veterans will provide the Tower. Towers will also be made available to encourage Urban Agriculture at VFW, LEGION, AND DAV locations and at base housing in the U.S.. In today’s slim job marketplace and the large number of returning military hoping to find civilian work, the inability to apply military developed skills to civilian job roles often results in frustration and despair. If the number of still jobless older Veterans is an indicator, there is cause for concern that many will depend upon SNAP and other supports.. Developed by the Orlando-based nonprofit VETERANS URBAN FARMING INITIATIVE to provide fresh produce for deployed troops in remote areas, through the support of the Joint Chiefs a civilian version will be made available to returning military as part of an unusual linkage in which public purchase funds Veteran grants. Delivery of some Tower components will be made available through cooperating retail outlets..
Lt. Col Steven George presented the first production model "HyDRIPonic" Tower to Dr. Jerry Brown, a 60 percent disabled, twenty year retired Veteran who served in the 101 Airborne Division Air Assault and worked in the Army Recruiting Command. The Tower developer will be returning to Orlando from Augusta to oversee the start of production by Veterans Friday. A retired Air Force scientist who once designed military weapons utilized a principle of Physics Fluid Dynamics from the 1700s called the Bernoulli Principle to create a simple way to distribute nutrients. It automatically feeds multiple plants on multiple levels instead of using electricity and expensive pumps and complex timers found in non-soil growing systems. He called it HyDRIPonic Technology due to its use of gravity to effectively promote plant growth without previous agriculture knowledge. No pipe dream, the 40inch high GROW ANYTHING, ANYWHERE URBAN AGRICULTURE TOWER in the carefully monitored Demonstration Project produced 140 tomatoes in only a 16 inch space making it ideal for encouraging Veteran feelings of successful accomplishment without any prior growing experience. The Initiative has several other unique characteristics. A new kind of conduit to channel funds from those seeking to help Veterans into funding grants which allow for the Veterans Tower to be picked up nationally. As an added civilian bonus, making a grant or purchase for personal use also provides an unusual cost offset. Since several weighty components at the retailer do not require underwriting the expensive shipping cost, the cost of providing the Tower is kept low. Civilian purchase may also provide a tax advantage. The Hope Collection provides IRS Proof of Donation Letter. Veterans or Veteran organizations may apply for a grant on the Internet. The public can suggest a worthy Veteran to receive one. Among the major Symposium participants were Sloan Gibson, Deputy Secretary of Veterans Affairs, COL Jim Isenhower, Special Assistant to the Chairman, Joint Chiefs of Staff, and COL Leo Thorsness, a USAF Medal of Honor Recipient.